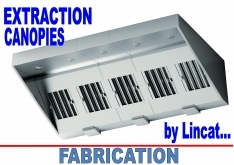 EXTRACTION CANOPY FOUR SIZES IN STAINLESS STEEL by LINCAT...(Once ordered we will contact you to ask 1) left, right or central fan. 2) horizontal or vertical mounted fan). SV1212: W1200mm x D1200mm x H700mm, 3 Filters. SV1216: W1600mm x D1200mm x H700mm, 4 Filters. SV1220: W2000mm x D1200mm x H700mm, 5 Filters. SV1224: W2400mm x D1200mm x H700mm, 6 Filters.